Mojitos are one of my favorite cocktails. 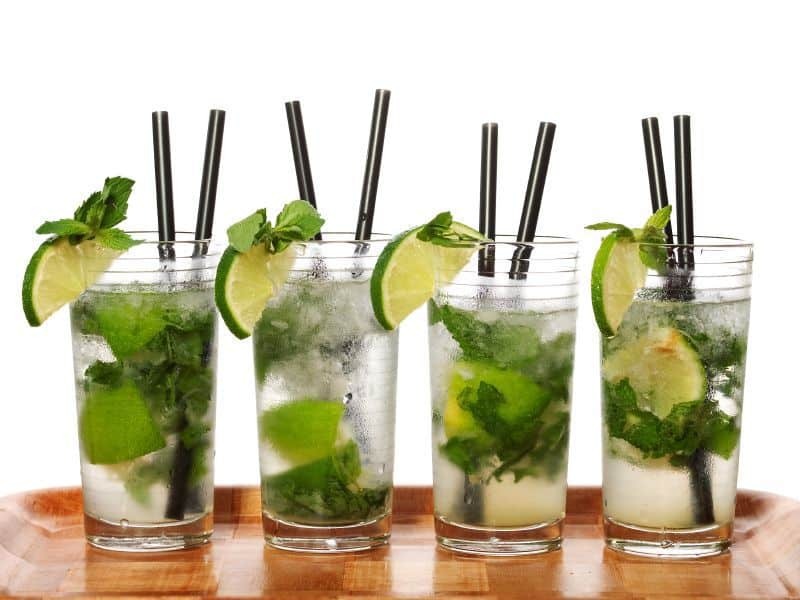 So simple to make, but I have had some mojitos that I have sent back in very well known bars. It shouldn’t be a mystery to make a really good cocktail, but sometimes it is really difficult to make a good cocktail. If you have never had a mojito this is a refreshing drink made with fresh mint, rum, lime, and ice. Looking for a way to cool off, a mojito is the way you want to go. In reality, this is one of the easier cocktails to drink. Living in Houston, the summers are brutal, and you want a cocktail that is going to be refreshing and light. Mojitos are the way to go. This is a cocktail that I often order, it doesn’t take a particularly skilled bartender to make this cocktail, but it does take someone with a few fresh ingredients. You can make an outstanding Mojito at home, without having graduated from Coyote Ugly school of bar-tending. This recipe is from my friend, Lee. He and his wife are known for their wonderful pool parties, where Lee dutifully tends bar. This year’s pool party brought us mojitos, avocado margaritas, and a few other tasty drinks. There have been bartending classes, and much sampling across the US for the perfect mojito, and I think you have it here. My good friend Lee has made these Mojitos before, and they were amazing, you can enjoy thee mojitos at home. Muddle the mint in the bottom of the mixing glass, then squeeze the juice of the lime into a mixing glass. Put the squeezed lime parts into the drinking or serving glass. In the measuring glass add the rum, simple syrup, and club soda. Pour the mix into the mixing glass and stir all the ingredients together. Next, pour the contents of the mixing glass into the drinking glass. Top off the drinking glass with ice, and you may garnish with a sprig or mint or two. This drink is good for summer heat. Oh I bet this makes for a tasty drink. I will try one with some brown sugar soon. love this! I always seem to associate mojitos with having a carefree summer. Great recipe! Love Mojitos! We’ve made it even simpler…around our area we have a soda called Tom Tucker’s Mint Ginger Ale…we use this with the white rum, crushed fresh mint and fresh lime…very refreshing! Whoa! What an awesome recipe! Looks great. Thanks for post. Looks great..